What do you do with a toddler who does an activity once and then decides it is too easy and not worth doing again? You show her the extension activities. Although, in fairness to Miss Oh she moved straight on to one of those shortly after her first attempt at building the tower vertically. There are a few extensions to show, one of which is building the tower horizontally as a stair. This was no problem for Miss Oh. In fact, she preferred to build it this way. 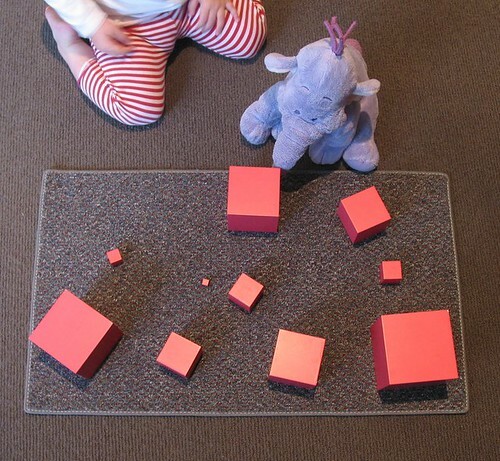 It also meant that she could anthropomorphise the cubes and play games with them. Strictly speaking I don’t think it is encouraged to use the materials for imaginative games, but personally I see no problem with it. It got her to interact with the pink tower and actually spend time investigating (and classifying by size) the different cubes. She makes comparisons of the cubes to a real life example – the smallest cube (1cm) became equivalent to her little brother, the next size up became the equivalent of herself, the 3cm became her Mum and the 4cm her Dad. However, she didn’t seem inclined to move on from this pattern of building and the tower was sitting alone in the corner of the living room, so I thought I would make an attempt to encourage her to build it again. 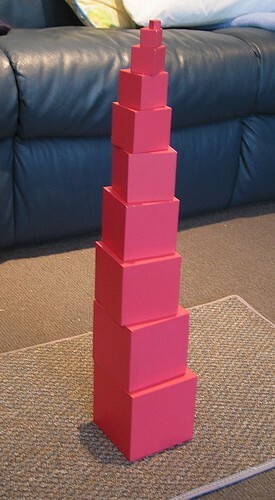 Another of the extensions is to build it vertically with two faces of each cube lined up together. This didn’t interest her and probably won’t for some time. As you will see in the photos that follow, the little Miss can build the tower but she doesn’t quite have the motor control to build it “perfectly” centred and most certainly wouldn’t be capable yet of the precision required to build it with two sides matched up. But there are more options available. 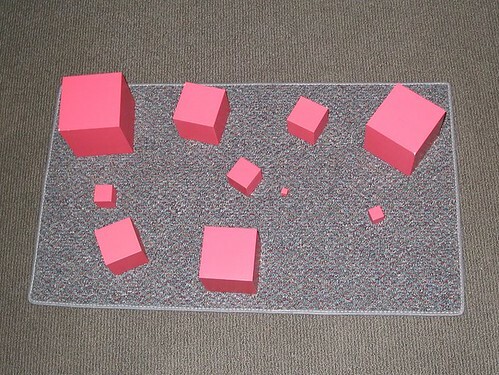 I went with the fourth incarnation as per David Gettman’s book in which you place two mats a wide distance apart, then arrange the cubes randomly on one mat. 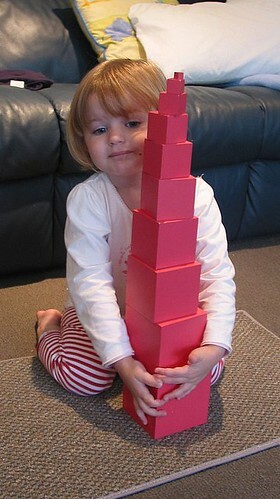 Your little one is then shown the process of choosing the largest cube, carrying it over to the distant mat and constructing the tower in that manner – one cube at a time. Here are the photos showing us in action. Showing her this activity has stimulated more interest in the tower and she has requested we do this several times now. So far she has completed the tower with no difficulty. If she loses concentration she may bring the one size smaller cube back, look at the tower and return to the starting mat and get the right cube, but this has been a rare occurrence. The next stage for me to introduce is working both up and down the size scale using the tower. That would be the fifth and sixth exercises in Gettman’s total of six. The fifth exercise works around a “larger” or “smaller” cube than the one presented, while the sixth exercise requests “the next largest” or “the next smallest”. 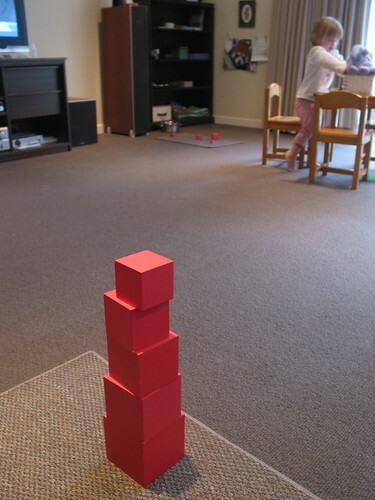 I think this will be reasonably straightforward for Miss Oh as working with the Pink Tower has reinforced her ability to distinguish a sliding scale of size across a range of real life items as well as the cubes themselves.